Journal : The Western Lancet ; vol. x.
San Francisco : Jos. Winterburn & Co., 1881-1882. Description : -296 p. ; [2 l.] pl., -386 p. ; ill.: 2 phot. ; 23 cm. Photographs : two composites, before and after surgery, of two views, with and without leg brace. Subject : Femur — Ankylosis ; osteotomy by Volkmann's procedure. Author caption: Paulo Devecchi, M.D., Turin. Emmigrated to San Francisco, 1880. Founder, St. Joseph's Hospital (Park Hill), 1893. Author: (1921), Modern Italian surgery and old universities of Italy. New York: Hoeber. Named reference: Richard Von Volkmann (1830-1889). [Having examined the patient lately, we were surprised at the very great improvement in his condition, and immediately said that the photographs did not do justice to the operation nor to the operator. 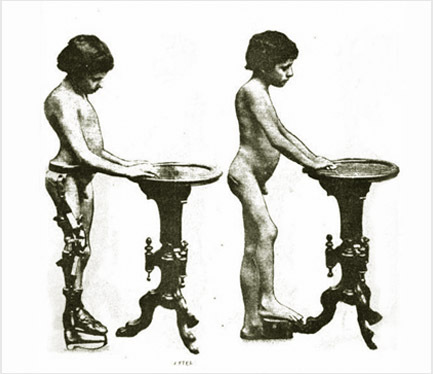 In the photograph taken after the operation, and without apparatus, the shortened limb is advanced more than is necessary, for it can easily be brought down parallel with the sound limb. 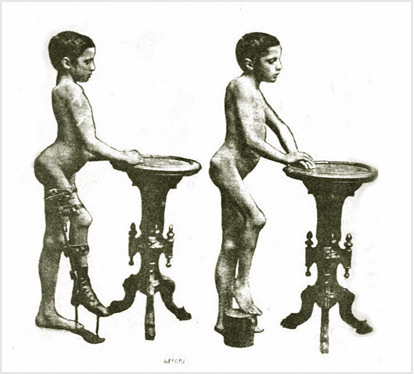 With the clothes on, the only deformity noticeable is the shortening, and the boy who formerly hopped and skipped about on one leg, now walks upon both almost naturally, with slight support from a cane, which he will soon be able to discard. Editor Lancet.] — Page 386. The surgical patient presented by this report is a 12 year-old boy with longstanding atrophy of the right leg caused by hip-joint disease. A photograph taken before the operation shows a five inch deficiency between the floor and the bottom of his foot, corrected by an orthopedic brace and iron elevator. Devecchi reviews several papers written by Volkmann on his procedure of subtrochanteric osteotomy, published between 1873 and 1879.